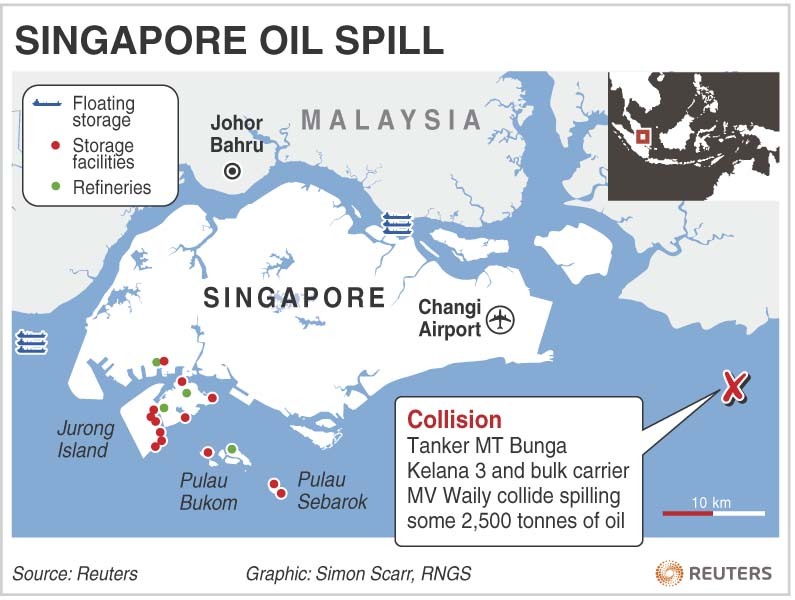 SINGAPORE/KUALA LUMPUR (Reuters) - An oil tanker and a bulk carrier collided in waters between Malaysia and Singapore Tuesday morning, spilling an estimated 2,500 tonnes of oil, but traffic in Asia’s busiest shipping lane was not affected. The Malaysian flagged MT Bunga Kelana 3 was carrying about 62,000 tonnes of light crude oil, the country’s coast guard said. Singapore port authorities said the spill measured about 4 kilometres by 1 kilometre and was located 6 kilometres south of Singapore’s southeastern tip at 2:20 p.m. local time. Singapore and Malaysia activated oil-spill response companies and a clean-up operation involving 20 craft was under way. There were no reports of injuries among the 50 crew members. The incident happened in the Traffic Separation Scheme (TSS) of the Singapore Strait, 13 kilometres (8 miles) from the tip of the island nation, the city-state’s Maritime and Port Authority (MPA) said. The spill, equivalent to about 18,000 barrels, is dwarfed by the approximately 175,000 barrels of oil that has poured into the Gulf of Mexico since the deadly April 20 offshore explosion that sank the Deepwater Horizon rig. It was less than a tenth the size of Singapore’s worst such oil spill since the MPA was created. As much as 29,000 tonnes of heavy marine fuel oil leaked into Singapore waters from the tanker Evoikos in 1997 after it collided with the Orapin Global tanker. “This is a relatively small amount in the general scheme of things, and it is not like the Gulf of Mexico, which is continuing to leak,” said Victor Shum from oil consultancy Purvin & Gertz in Singapore. In terms of the impact of Singapore’s spill on the environment, Shum said: “I think certainly the concerns are there. Even if it is contained, it will take some time to clean up.” The 1997 Evoikos spill took three weeks to clean up. Singapore and Malaysia were applying oil dispersants and containment booms for the cleanup, MPA said. About 40 percent of global trade passes through the Malacca Strait between Malaysia and Indonesia’s Sumatra. Singapore, the world’s largest bunkering port and Asia’s top oil-trading hub, lies at the southeastern end of the waterway. The collision was between the tanker and the MV Waily, a bulk carrier registered in St Vincent and the Grenadines, which suffered minor damage, the Malaysian coast guard said. Both vessels are anchored away from the incident’s site. The collision caused a 10-metre gash on the left side of the tanker, the coast guard said. The vessel was carrying Bintulu condensate and light crude, said Paul Lovell, head of corporate communications at AET Tanker Holdings Sdn Bhd. AET, which owns and manages the vessel, is a wholly owned subsidiary of transport and energy company MISC Bhd, a unit of Malaysian national oil firm Petronas. “She was carrying two types of cargo, some condensate and some very light crude, it was about 40 percent condensate and about 60 percent light crude on the vessel at the time of the incident,” Lovell said. “It looks as though the spill would have been from the very light crude, the exact amount I can’t tell you.” The spokesman could not say who owned the oil. MISC on its website lists the Bunga Kelana 3 as an Aframax class tanker built in 1998 with a dead weight tonnage of 105,784.